Well, after nearly 30-hours of travel we are here in Mombasa, it’s 2:30 am Friday morning. Here are a few updates: The send off party was incredible with a mini concert from the Grammy Nominated African Children’s Choir. 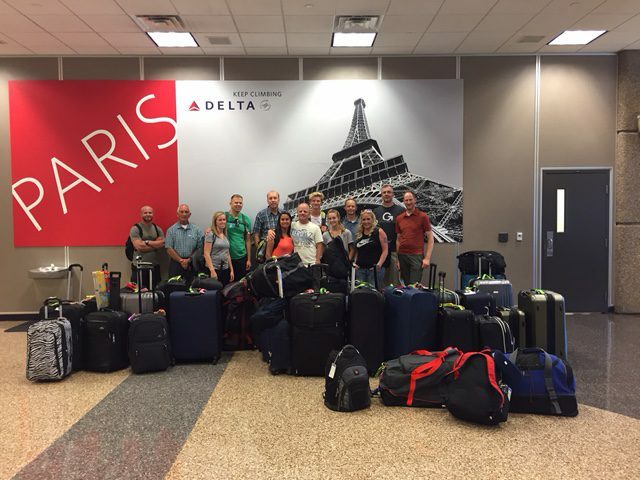 The timing of the group traveling through Kaysville hours before departure made for a perfect experience to get us ready. After the send off party we headed to the airport to get our luggage tagged and get everyone checked in. The team was ready to board at the gate when we learned of a maintenance delay, which only increased nervousness as the new departure time was schedule 40 minutes later yet we could see a lot of activity around the plane. The departure time passed and the update came that the aircraft had been struck by lightening on an earlier flight and the maintenance crew was confirming the aircraft was safe for a 10-hour flight. The delay extended to 4:00. Our fearless leader Steve put his sharp mind to work calculating impacts to our layover Amsterdam. No impacts were expected. We finally pulled out of the gate at 5:23 pm, three hours later than expected. The team had opportunities to tell the person next to them on the plane about the journey we are on and that there were so many people who raised money, donated supplies and helped prepare items for this amazing experience. One person said “What an incredible thing your company is doing, it will make a difference in the lives of those you help in the villages.” We arrived in Amsterdam just before 11:00 am local time with a little over an hour to make the connecting flight to Nairobi. Once in Nairobi we collected our luggage and made it through customs and to the last flight to Mombasa. The flights were uneventful with only a few kinked necks and a little restlessness from the long flight times. We are now in the hotel, looking to get some rest and are mindful of the support from each of you.